Houses & Homes VA: Do business partnerships ever really work? Do business partnerships ever really work? Have you ever considered having a partner instead of going it alone? There are times when this thought can be very tempting to those of us that have had our share of long hours, endless nights and booked up weekends but does it ever really work out? We’ve all heard the horror stories of two friends that decided to go into business together. Not only does it always end with one (or both) of the partners leaving the business but as often as not the friendship is over as well. So does this mean that partnerships are always a bad idea? No, but planning a business partnership with an associate or a friend takes a lot of consideration and a lot of planning. 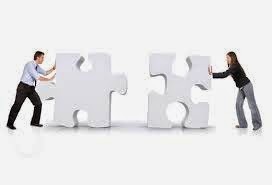 It is similar to a marriage and if you know the divorce rate in our country than you just might be getting an idea of just how difficult a successful business partnership can really be. There are advantages and disadvantages to any union between two people and it is important to be aware of both before making a decision. The first thing you must ask yourself is “Am I a good business partner?” When considering such propositions we are always thinking about our potential partner and what they might bring to the table but first you need to take a look at yourself. Could you “deal with yourself” if you were someone else? Are you open to suggestions and willing to try something new even if it is not “your way”? If the answer is no than there’s no need to consider a partnership with anyone else. If you couldn’t deal with you, chances are that no one else can either. If you have decided that you are a good partner than it’s time to take a close look at your prospective other half. The bottom line is can you deal with them? Are they open to suggestions and willing to see things your way even if they disagree? If both partners are not equally pliable than it is almost certain that the business is doomed. There are many advantages to a partnership but only if the right two people are involved from the very start. If you are able to find your “better half” than you can look forward to sharing the start up costs of the business with someone else as well as the recurring expenses of running the business. Your financial risk is cut in half when you have a partner and you will have someone to depend on when you are not always available for clients or other important duties. You should expect support and motivation from your partner when you need it the most and if you’ve chosen well your abilities will complement each others in a way that will make both of you better at what you do. One thing that most people never consider is being prepared for success. That’s right, prepared for success. What does this mean? Well, people change when they finally achieve the level of success that they have always hoped for. You’ve heard the story before; two friends decide to make a go of it in business and after years of hard work and dedication they finally make it big. Partner A is diligently working in the business to ensure that it keeps going strong but partner B has decided that it’s time to enjoy the fruits of his/her labor. “B” is out on his new boat almost all of the time now and “A” is the one keeping it all together. This is a very common story, it happens all the time. Making it to the top is only half the story, staying there is equally as challenging and if one person is doing all of the work than it’s no longer a partnership, is it? I’m not saying that partnerships never work but it all starts t the very beginning. Choosing the right partner will determine your future for many years to come. Be wise, be diligent and above all else, be sure that you are not the bad partner in the end.